Spring aspirations on the line with four runners on a big day at Caulfield on Saturday. Vengeur Masque, War Legend, Trendsetter and Lakhoni are all runners on a track rated Good(3). Trendsetter is the first to go in the third race and his task has been made easier with several scratchings reducing the field to 13. 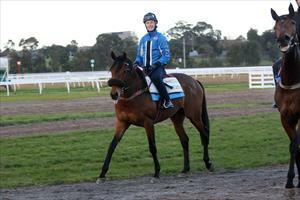 After two starts the distance of 1800m is more to Trendsetter’s liking. “We’re really happy with him and he’s getting fitter,” Moroney said. “He’s not normally a flash trackworker but his work has been good and he’s very well in himself. Lakhoni races for the second time in race four following his impressive debut win and his opposition has also been reduced by scratchings. Moroney is concerned about the lack of experience with the son of Dalakhani. “He’s struck a strong race which is what you would expect at this time of year,” Moroney said. “Ideally you’d like to see him fly the gates and get across and have some horses around him as that home turn at Caulfield is pretty tight. War Legend resumes in the fifth race, the Open Handicap over 1400m but has drawn one from the outside. “He’s drawn a very sticky gate so we don’t really have a choice other than to ride him quiet,” Moroney said. “If they kick on and run it at a strong speed then that will help. Ideally we can tuck in and then have a crack at them late. Vengeur Masque (pictured) runs in the feature race of the day, the Naturalism Stakes (Gr 3) over 2000m but he too has not been favoured by the barrier draw. “There does look to be a bit of speed in the race so the plan will be to keep off the rail and get some cover,” Moroney said. “We couldn’t be happier with him - he’s tightened up a bit from the first-up run and he’s very well in himself.